A big part of building a new web application is repurposing common patterns, one such pattern is the ability for users to sign in and out. One way of solving this quickly is by using Facebook Connect. 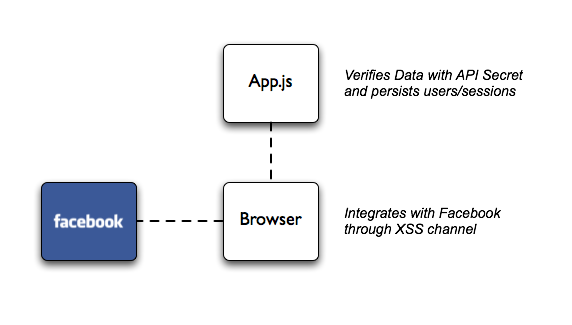 To make our application work, we only need to implement two files: index.html and app.js. That's right, we're only using AJAX calls and static files. 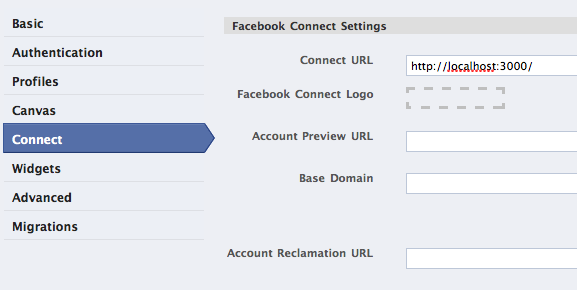 GET /fbSession - Is the current user logged in? Or is there a cookie/param present I can use to authenticate? In this article we went into the direction of putting a lot of UI flow and controller logic into the browser. This can be quite counter-intuitive. As a Rails-programmer and former RJS lover, I can attest to that. However, while there are still remaining issues like SEO and accessibility, this approach allows the server to really focus on data modelling/routing and has numerous scaling benefits. All examples in this article and more can be found on the node-facebook repository I created. If you run into any obstacles, feel free to contact me or fork the code. I hope to soon write a similar plugin for Twitter's OAUTH based login. Are you sure xd_receiver.htm is in place and being accessed? element is present in the body? Are cookies being set successfully after FB connect? Are you sure you're using the correct API keys?